Remember that one day when you could wake up without an alarm? When you would get your favorite bowl of cereal and sit between the hours of 8 and 12? This is a blog dedicated to the greatest time of our childhood: Saturday mornings. The television programs you watched, the memories attached to them, and maybe introducing you to something you didn't realize existed. Updated every weekend. 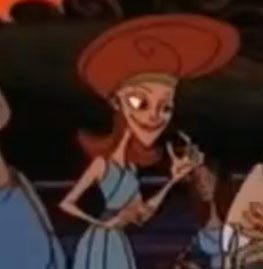 Mostly an on-screen actor, she did provide her voice for two episodes of Disney's Hercules series as Evelyn, Cassandra's mother. Chris is a freelance writer and editor. He is currently the president and publications coordinator of the Comicbook Artists Guild and heads up their New York Chapter. 2015-2018 Atomic Media Group. Awesome Inc. theme. Powered by Blogger.